When I began my research into tapa cloth, I found that this form of beaten bark cloth is something found all over the world, not just in Polynesia. There are forms of it in diverse places separated by great distances such as in Africa, China, South America, and the jungles of Borneo and Paupa New Guinea. I will be mainly concerned with that of Hawai’i and Polynesia…According to Peter S. Buck (1987), Hawaiian kapa was some of the finest that was made in its whiteness, delicacy, and softness. 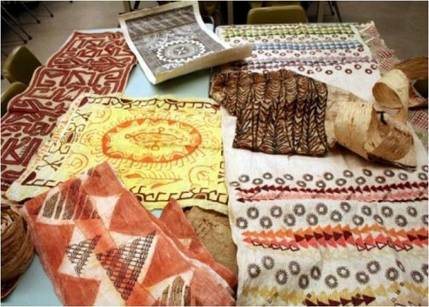 There is archaeological evidence that making cloth from tree barks spread to Polynesia originally from Southern China and South-East Asia and has been practiced for thousands of years. As stated by Neich and Pendergrast (1997), studies of linguistics and archaeology show traces that tap-making is a skill from the Lapita ancestors of the Polynesians. Some experts also assert that design patterns show a link between the Lapita pottery, tattoo design, and tapa design of Polynesia. Archaeological evidence also suggests that some of the necessary plants for tapa-making were carried from South-East Asia through Papua New Guinea and the Soloman Islands easterly to the South Pacific Islands. The most common plant to be used is the paper mulberry tree (Broussonetia papyrifera), wauke, in Hawaiian, which is a native of eastern Asia. In addition to the paper mulberry tree, the inner bark of other plants is also known to be used for the bark cloth in Polynesia. Usually, the breadfruit (Artocarpus) tree, and some species of the banyan (Ficus) are used, but they produce a heavier, coarser cloth. Only the paper mulberry was cultivated and harvested especially for the purpose of making bark cloth. The paper mulberry tree cannot be grown from seeds because it does not flower. So the plant is grown by propagating from cuttings. The paper mulberry tree needs plenty of water to grow so that some South Pacific islands were not able to to grow it and either resorted to using another tree bark, or traded with neighboring islands who grew it in large amounts. Another variety of mulberry is used in the making of silk. The silkworm digests the leaves and then secretes silk fibers in a cocoon, which are later woven into cloth.